Let’s say you’ve been a homeowner for 15 years, raised children in your home, held down a good and steady job in the community, made memories to last a lifetime, and cared meticulously for your home over the years. As time has passed, you’ve either outgrown the home as you have welcomed new babies or are ready to downsize as your children have moved out and grown up. Maybe after all those long years of hard work, it’s time to retire in a comfortable climate that promotes the desired lifestyle of laying by the pool, golfing, shopping, and visiting grandchildren. Or perhaps you are ready to upgrade your starter home. Whatever your circumstances, Sacramento property management company, RPM SAC-METRO, urges homeowners to carefully consider the decision of renting out your home versus selling. During the first part of a 30 year mortgage, most of the money in your monthly payment goes to pay down the interest. Very few dollars go towards the principal of the loan amount. Of course this is dependent upon the length of the term, your interest rate, and down payment. Don’t let all those years of paid interest go down the drain. You made the monthly mortgage payments, now let someone else make them for you until the house is paid off. Remember that large lump-sum of money you transferred from your bank account all those years ago the day you closed on the house? Down payments and closing costs account for a big amount of the money you spent on your home. Closing costs typically range between five and ten thousand dollars, which have nothing to do with the equity you gain your home. Selling your home, when you don’t need the cash to purchase another property, would be unwise. Sacramento property management companies know that purchasing an owner occupied property and living in that property for a few years works in your benefit if you plan to build wealth with real estate investments. Interest rates for owner occupied homes are directly affected by credit score, the type of investment property, and your down payment. Let’s pretend your interest rate would be 4.5 percent for an owner occupied residence. However, if you choose to buy a house with the immediate intent of renting it out, you could plan on an interest rate closer to 5.0 – 5.25 percent for a single family residence. This proves the benefit of property management in Sacramento, CA, when choosing to rent out your once owner-occupied home, and transition it into a tenant-occupied home. Lower interest rates. Few things are as wonderful as having someone paying for equity in a house for you. As your tenant makes the required monthly payment, you are getting further along in your quest to build wealth in the real estate market. Put simply, your tenants are buying a house for you. If you eventually choose to sell the home, you get all the equity back, not the renters. Homeowners who transition their homes into investment properties must ensure the rent amount covers the all home expenses, as well as protects you during vacancy times. If it does not, you may reconsider your option to rent. Is it Profitable? If only it were as easy as collecting an on-time rent check once a month, renting out your house would be a piece of cake. Unfortunately, it’s not that easy. That’s why property management companies exist. They do the dirty work for you, sometimes quite literally. Before choosing to rent your your home, it is crucial to do market research to determine the rent rate you could ask for your property. Your asking rent rate must be sufficient to cover the principal and interest (mortgage), HOA fees, taxes and insurance, maintenance, advertising, vacancy, and Sacramento property management fees. If your asking rent rate covers these expenses and more, you are looking at a positive cash flow rental property – the best of all worlds. How’s the Market? Just like home prices, the rent market has been on the rise in recent years. Some housing markets seems almost fail-proof with rising numbers – the Bay Area and Sacramento markets being some of them. Some homeowners feel the need to make big repairs to their home before selling in order to get top dollar, but when you choose to rent out your home, time is on your side. If you are short on funds right now, you might have the money for the repairs in six or twelve months. Renting out your home for now would allow you time to save for those repairs. And who knows, you might like renting out your house so much, you keep the property as a rental forever. Are you coming back? In the fast-paced world we live in, we sometimes feel the need to make life altering decisions immediately. Decisions like, “should I sell or rent my home?” This decision should not be a hasty one. However, many homeowners relocate for jobs or retirement, and do not know where the next turn in the road will take them. They like the security of knowing they have a “home” to go back to, if things do not work out elsewhere. Selling and purchasing another home incurs costs. 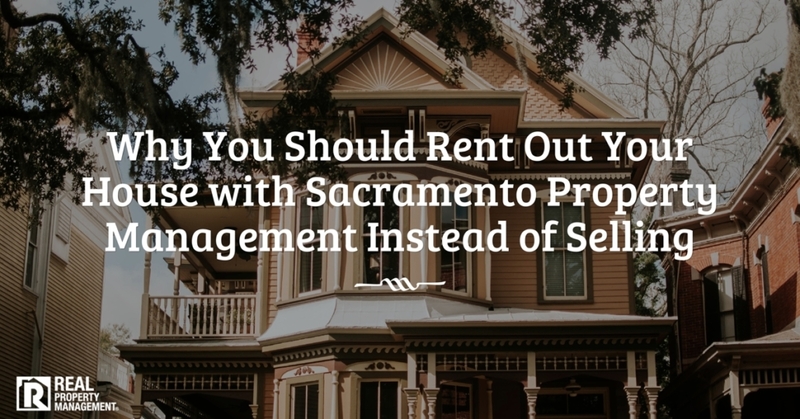 You save money and gain more equity in your home when you choose to rent it out with companies who specialize in property management in Sacramento, CA, like SAC-METRO. Let someone else build your wealth through real estate investments by choosing to rent out your home with our expert team at SAC-METRO. Call us today.